Be the first to share your favorite memory, photo or story of Kenneth "Kenny". This memorial page is dedicated for family, friends and future generations to celebrate the life of their loved one. 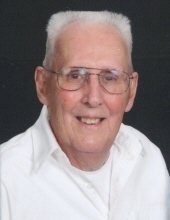 Kenneth Gordon Gentry, 87, passed away 12:33 a.m. Tuesday, June 19, 2018 at the Herrin Hospital surrounded by his loving wife and daughters. Kenny was a Shear Operator at Norge Industries for 43 years. He was a U.S. Army veteran serving in the Korean War. He was a Lifetime Member of the Marion V.F.W. Hyde-Pillow Post 1301. Kenny enjoyed watching baseball, gardening, fishing, spending time with family, especially his grandchildren, and telling jokes. Kenny loved people and loved visiting with everyone; if he didn’t know you he would make sure he got to know you. Kenny was born July 18, 1930 in Herrin, IL to Percy and Alma Jean (Mainer) Gentry. Kenny was united in marriage with Wanda L. Barham on July 2, 1955 at the Herrin First Baptist Church. Surviving are his wife of 63 years, Wanda L. Gentry; two daughters and son-in-law, Kendra Gentry-Gill of Streator, IL, Alison & Trenton Funk of Elkville, IL; five grandchildren, Tyler Funk, Clayton Funk, Sydney Gill, Brody Gill, and Reese Funk; brother, Steve Gentry and his companion Brenda Gentry of Herrin; two sisters and a brother-in-law, Doris and Jerry Hirtz of St. Peters, MO, Bonnie Gentry of Herrin; sister-in-law, Nadine Gentry of Energy; brother-in-law and sister-in-law, Jim & Phyllis Barham of Herrin; aunt, Wilma Childers of Phoenix, AZ; special friends, Theresa, Tyler, & Isaac Webb, Tammy & Lynn Hanley; and several nieces and nephews. He was preceded in death by his parents; sister, Betty Jane Doyle; and brother, Bill Gentry. Services will be held at 1:00 p.m. Thursday, June 21, 2018 at Meredith-Waddell Funeral Home with Rev. Don Colson officiating. Visitation will be from 11:00 a.m. until 1:00 p.m. Thursday at the funeral home. Interment with military graveside rites conducted by the Marion V.F.W. Hyde-Pillow Post # 1301 & American Legion Post # 147 and the IL Army National Guard Honor Detail will be in Barham Cemetery in Marion. The family prefers memorial donations be made to the Alzheimer’s Association, 320 East Walnut, Suite A, Carbondale, IL 62901 or This ABLE VETERAN, 1714 South Wolf Creek Rd, Carbondale, IL 62902; envelopes will be available at Meredith-Waddell Funeral Home. To send flowers or a remembrance gift to the family of Kenneth "Kenny" Gentry, please visit our Tribute Store. "Email Address" would like to share the life celebration of Kenneth "Kenny" Gentry. Click on the "link" to go to share a favorite memory or leave a condolence message for the family.